There’s a surprising announcement on the front-page of Amazon. “Limited time only…” it reads. Amazon’s color Fire HD7 tablet is now just $119! It’s a “thank-you sale”, according to Amazon. 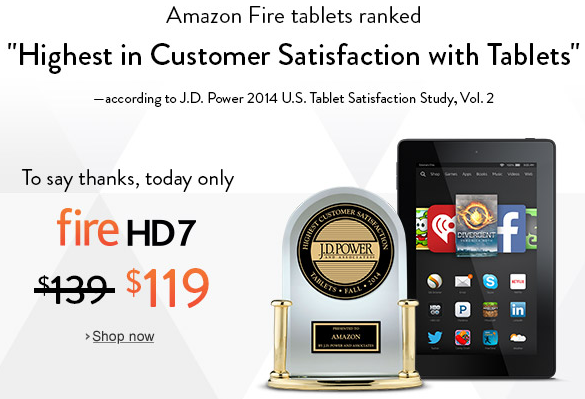 Customers voted Amazon into the #1 spot — “highest in customer satisfaction” for tablets — in a survey of by J.D. Powers. Apple’s iPad came up short, finishing second, and in third place was Samsung’s Galaxy Tab. But Amazon was so excited, they’ve rushed out a discount on their Fire HD 7 tablets. Normally it retails for $139, but Amazon’s offering a special 15% discount. If you want an even cheaper tablet, Amazon also offers a six-inch “Fire HD 6” tablet Fire for just $99. You may even start to wonder if Amazon’s selling these at a loss, because Samsung’s Galaxy Tab 4 costs a full $199. 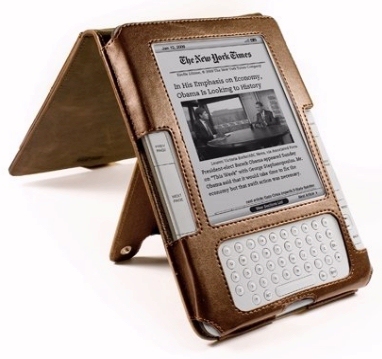 Amazon’s tablet has the exact same high-resolution display — with 216 pixels per inch — and the same two built-in cameras. And of course, Fire HD 7 tablets are available in five different colors (Yellow, Pink, Blue, Black, and White)! But the low price may be helping Amazon in more ways than one. The voting for “highest satisfaction” was incredibly close, and on a scale of 1 to 1,000 the top three tablets were all within six points of each other. Amazon beat Apple by just three points, and Samsung’s tablets were just three more points behind. For years Apple had always won the “highest satisfaction” award, every year that the survey was taken, in an unbroken streak, according to Computerworld — until the end of 2013, when they faced a surprise upset by Samsung’s tablets. Today Amazon is blasting the news. “Fire tablets ranked ‘Highest in Customer Satisfaction with Tablets,’ screams the announcement on their front page. But of course, it’s also becoming a win for holiday shoppers. A Funny Free eBook for Thanksgiving!